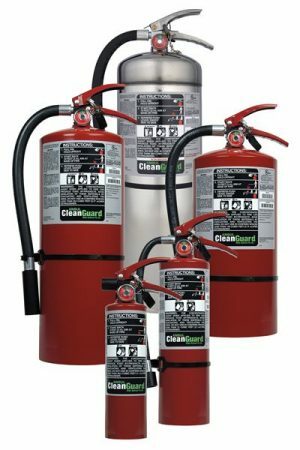 ANSUL Carbon Dioxide Fire Extinguishers are designed to protect areas where Class B (flammable liquids and gases) or Class C (energized electrical equipment) fires could occur. 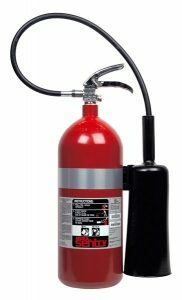 The easy grip handle provides non-slip holding and quick activation of the extinguisher. 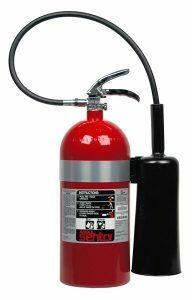 The ring pin and visual seal help prevent unwanted discharge of the extinguisher. 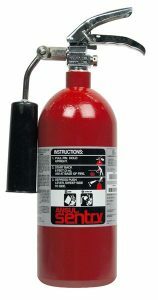 If the extinguisher is tampered with, the visual seal self-destructs, making detection of tampering easy. 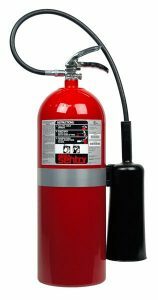 Metal ring pins are designed to help prevent accidental discharge if the extinguisher is dropped or mishandled. 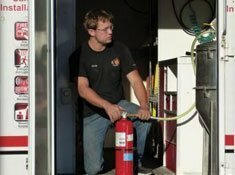 Operation instructions – Easy to follow pictographs and instructions allow novice fire fighters to operate the unit correctly. Agent identification and fire class rating – Pictographs and clear, simple statements show what fuels the agent can extinguish. 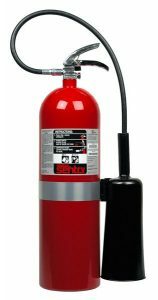 After use instructions – Provide basic steps for extinguisher recharge. The one piece steel shell is deep drawn from tough, low carbon steel to provide resistance to impact, vibration and corrosion. The steel shell has a fluted base for stability and reduced corrosion. The aluminum shell model is sturdy, yet lightweight. 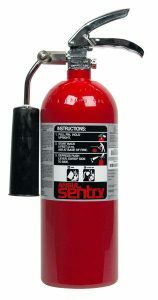 The special red powder paint finish makes the unit easy to locate in an emergency. The paint resists cracking and chipping, adding to the corrosion resistance of the shell. 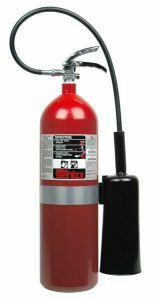 The 5, 10 and 15 pound extinguishers are available with a U.S. Coast Guard approved vehicle mounting bracket, or a standard wall hanger is available for all sizes to provide versatility in extinguisher selection and application. Non-corrosive, non-conductive, clean extinguishing agent. Steel shell is deep-drawn for higher tensile strength and lighter weight than standard steel shells. The steel shell also has a fluted base design which resists corrosion for a longer service life. Lightweight aluminum shell also available. 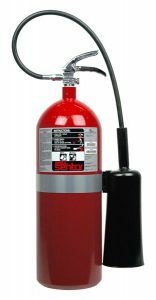 Both steel and aluminum models are available in 5, 10, 15 and 20 pound sizes. All models are UL listed. Aluminum models are also ULC listed. 5, 10 and 15 pound models with heavy duty vehicle brackets are U.S. Coast Guard approved for marine use. Most other manufacturers’ brackets do not meet Coast Guard requirements. 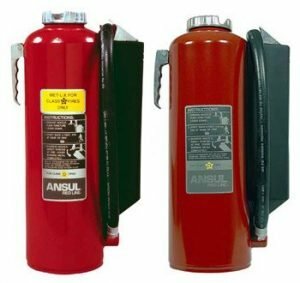 ANSUL Carbon Dioxide Fire Extinguishers are designed to protect areas where Class B (flammable liquids and gases) or Class C (energized electrical equipment) fires could occur. 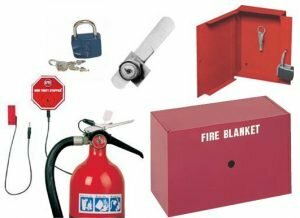 They may be used indoors where winds and drafts do not affect discharge or where a clean extinguishing agent is required. Fire Suppression Capability: Novice Operator 5 ft. (Underwriters Laboratories classifies a ‘‘novice operator’’ as one who has little or no experience in operating a fire extinguisher), Experienced Operator 12.5 ft.
Fire Suppression Capability: Novice Operator 10 ft. (Underwriters Laboratories classifies a ‘‘novice operator’’ as one who has little or no experience in operating a fire extinguisher), Experienced Operator 25 ft.